When your construction project begins, your mind will likely be filled with many competing priorities. The safety of those in and around the jobsite shouldn’t be one of them. Not when you’re working with a commercial construction company who genuinely believes safety is the most important thing we do ─ every day. Far beyond just our construction team and crew, we embrace a collaborative culture of safety and are committed to making sure your staff, facility users and members of the public return home safely when each day is done. Our quest for a zero injury work environment isn’t just a priority. It’s a key tenet of our company. We emphasize safety, because simply, it’s the right thing to do. An embedded culture of safety starts with ownership — leading by example. Starting with our CEO Mike Bolen, to each and every one of our employee owners, a never-ending focus on safety is at the heart of what we do. Working closely with your team, McCarthy’s full-time safety professionals will coordinate proactively with trade partners and industry experts to customize our approach to make sure we’re planning for safety on your commercial construction project each and every step along the way. Safety is the highest priority for McCarthy. Working safely ensures your project stays on track and your business goals are achieved. McCarthy utilizes leading indicators and observation-based programs to support our vigilant commitment to creating a safe workplace, and in every significant lagging indicator measure, we’ve consistently outperformed the industry by a wide margin for more than a decade. McCarthy’s quality standard also helps to account for our consistent safety record. With quality built in at every step, rework is reduced or eliminated, reducing the chance of accidents and injuries. And we’re never satisfied. While we strive to not only be the safest commercial construction company in America, we’re constantly pushing to improve safety performance, directly supporting business results for our clients and raising the bar for trade partners and the industry. Our experience modifier (EMR) has produced a credit on our workers' compensation insurance premium for each year since 1993. The attention to detail and to safety by McCarthy is second to none. 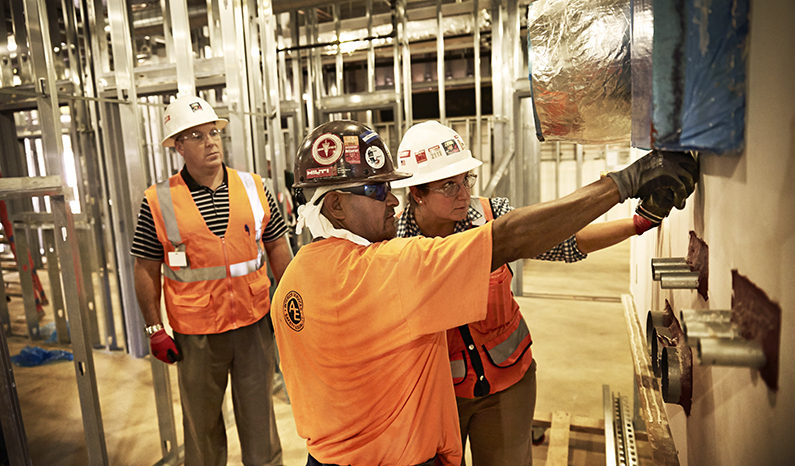 Everyone needs to be on the same page for a commercial construction safety program to work. Over the past decade, we've taken this team approach to a new level by partnering with OSHA through their Strategic Partnership Program (OSPP). Together we’re working cooperatively to address critical safety and health issues. This very different approach is proving to be an effective tool for reducing injuries in the workplace. The purpose of the award is to identify businesses who demonstrate commitment to jobsite safety and exhibit exemplary safety performance.